Wondering how malware gets on your computer? How software like malware and spyware spreads? This is a guide for all computer users to be aware and avoid getting infected by these malicious softwares. Malware, without a doubt is a deadly push for your computing devices, and can harm it to such an extent, that you might even consider fencing up for any future dangers. A malware can easily steal your personal information, can play with your finances, can spoil your system and much more! But with the help of an anti-malware program, combined with an active internet firewall and an updated operating system, you can keep your system safe and protected from all kinds of malware attacks. These measures are very simple and helps in securing your system for a long term. Although no matter how many measures one might take to safeguard their computer, there is always a possibility of your system getting attacked from malware. This is because skilled cyber criminals, hackers, spoofers and sneakers steadily derive ways to get a loophole in the security of your computer. The basic security measure against defending your system from malware attacks is to thoroughly recognize the way malware slips into your computer. Malware? What Exactly It Is? Malware is nothing but a piece of software, which is designed in order to interrupt the normal working of a system, steal personal and confidential information, alter and leave the system burned out! So basically malware is a software which is malicious, hence the name malware. Malware can be of different forms and they aren’t limited to any particular type; these could be worms, viruses, trojan horses, spyware, adware, keyloggers etc. Despite their normal behavior, one shouldn’t take them for granted, as these kinds of malware can cause a great extent of harm to your computer and your personal information as well. What makes a malware more suspicious and deadly is that it can run on your system undercover and secretly, without you getting any hint about it. How Malware Gets Into Your Computer? Internet is full of pranksters, bullies and hackers - they will eventually come up with something or the other to scare an internet user. Scareware is a new concept of roughhousing with internet user by making them believe that their system is infected with a virus, and all they got to do is download a software to get rid of it. These might pop up almost anywhere and read “click here” and so on. The reason why these popups are so much efficient is, because a significant amount of users have no freaking idea as to how viruses get transferred, or how legit these popups are! Despite their fishy nature, scareware pop up ads generally are malware apps which deceive people into clicking that particular ad, so that they could get a pass to your computer. Once it is done, a malware can infect your computer easily. So it becomes very important to stay updated with the kind of softwares (especially your antivirus!) you have on your system and freshen them up time and again. Spam links are an everyday scenario - we receive those annoying spam emails which head away straight to our junk or spam folder. But these spam email messages do contain some of the most tempting and convincing content that might give you an illusion of getting something out of this world. Or intermittently you might have received an email from a person in your contacts list, but the mail looks dubious. Sometimes an email might contain a link, or an attachment (which is obviously put to tempt you to open it!) that might be a portal to malware’s hell! Make it a point to confirm the source of the email before you open an attachment or click the links included in the email. Or you can ensure the identity of the contact that sent you the mail/link/attachment, or run the mail through an antivirus program which will scan it for any possible threats. Mostly, Adobe Acrobat Reader is the default program to open up many files, PDF files being the prime. However, a couple of times (mostly intended) a cybercriminal might create a PDF infected with malware, and opening this file by default with the help of Adobe Acrobat Reader might pose a greater risk to your system. Make sure you keep all your programs well versed and up to date, and don’t forget to scan your files with an antivirus program. The most passable errors people make is signing in to their accounts via clicking on the links that might have been sent in a dubious email, such as an email from a “bank”. What people don’t understand is that no bank or organization will send such sort of email asking you to login or provide your login details. These are phishing attacks or malware attacks. If you ever get any such email, it's better to contact your bank. Piggybacking is actually a smaller program that gets installed without the prior notification while one is equipping the required software into his/her device. For instance Avast install the dropbox where Adobe reader install the toolbar plugin or any security software or spyware without letting the concerned user know about it. Although there are some software that provide you the facility to uncheck the unnecessary downloads but some perform the action without letting you know about it. Therefore it’s essential to read the terms and conditions in the course of installation process so that you can be aware of the additional program that will get planted into your phone. Browser add ons are the small software that are added to the web browser such as the toolbar, search box, animated objects. The add-ons can become nasty as sometimes the spy program can also be the part of these web add-ons. It takes great effort to get on the track if these fierce enhancement leads to the website getting hijacked, as the bug in the form of an additional factor intensely gets attached with the website. So it’s suggested that you carefully review the browser add-ons before installing it. These were the 7 ways a malware can get inside your computer, but who knows there might be more! Just remember to keep safe and put up all your guards in order to avoid any kind of attacks. 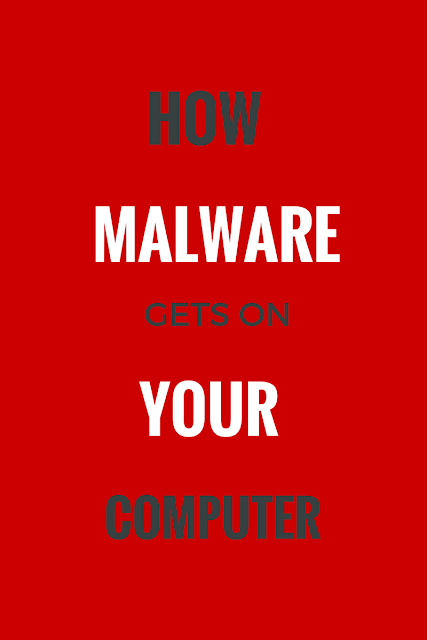 Keep scrolling to know the ways that can help you stay away from malware. DO NOT click on the website link that you’re unsure of. Immediately leave the dubious website and search for other website link for your required search material. Be careful of the content associated with the spam emails especially if it contains the links or attachments. Make a habit of scanning the secondary storage devices like disc, pendrive, flash drive before you use the same on your systems. Avoid checking the pop up boxes appearing on the window. It’s advisable to close the windows by clicking on the cross button [x] or press Ctrl+Alt+Delete. Review the message boxes that appear while you’re installing any kind of software onto your device as it might contain the malware. Keep your Operating System and browser updated as this will keep the malware at bay. Block the Pop up windows and automatic feature updates. Run an antivirus program that has an anti malware element to stay safe. Ensure it’s updated and turned on. Equip the device with the third party firewall or else use the Windows firewall. Consider the spam filtering software if you’re unsure that your email program can filtrate. How To Do Removal Of Malware? No matter how much care and precautions you take to prevent the malware entering your system still you will be trapped by it. Therefore it’s highly recommended that you use a good antivirus software to ward off your system from any kind of virus, spyware or malicious programs. Kerrie writes cell phone spy reviews for spy software such as mSpy, FlexiSpy and Highster Mobile Spy and help people in choosing the best cell phone spy software at spyengage.com.